Greek: "mys" - mouse; "ous"- ears. Fur: Yellowish (or reddish) brown above, pale (yellowish) below; hair-dark base, yellowish brown tip. Tail membrane: Dark brownish, few hairs. Ears: Long (16+ mm), extending more than 2 mm beyond nostrils when laid forward, darkish, naked and pointed. Tragus: Longer than one-half ear length; pointed, not obviously curved. Total length: 76-87 mm. Forearm: 32-39 mm. Wingspan: 228-258 mm. Total weight: 5-9.5 g.
Tooth number and formula: 38 total; I 2/3, C 1/1, P 3/ 3, M3/3. 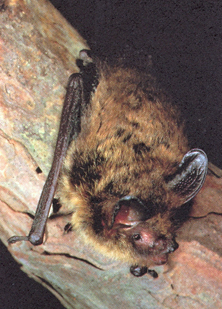 Similar in size and appearance to other Myotis; little brown myotis (M. lucifugus) and Indiana myotis (M. sodalis) have shorter ears «16 mm), shorter and blunter tragi. Overall: From North and South Dakota, southern Canada, and Maine to Arkansas, Alabama, and Georgia. Iowa: Statewide, but few records from western counties. Although similar in size and appearance to the little brown myotis, the northern myotis has a very different lifestyle. It is more of a forest dweller and, in summer, can be seen foraging for insects over water and clearings, often flying low under the tree canopies. Because of its largish ears, the northern myotis is thought to locate some of its prey on surfaces. Foraging activity begins shortly after sunset and continues throughout the night, peaking before midnight and again just prior to sunrise. The little food data available suggests consumption of a variety of insects, including several kinds of true bugs, leaf-hoppers, ichneumon wasps, moths, and flies. In summer, females primarily utilize forested hillsides, rivers and streams, and cluster in groups of 50 or more to form nursing colonies in tree cavities or under loose bark where they give birth to their young. Occasionally, this species is also found in buildings. 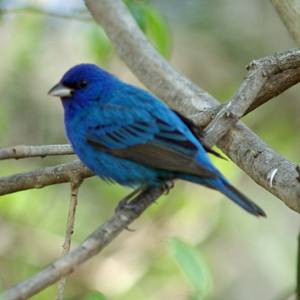 Males usually roost singly, often in tree cavities, caves, mines, and small caverns in the vicinity of nursery sites. Most mating probably occurs in fall with uterine storage of sperm cells until fertilization in spring. Usually a single young is born in June and the earliest born begin flying by the first week of July. The nursery colonies disband shortly thereafter; by early August most individuals have left their summer roosts. In late summer, some congregation occurs, perhaps associated with mating. During both spring and fall migration, males and females may roost in or on the sides of buildings, increasing human contact with the bats. 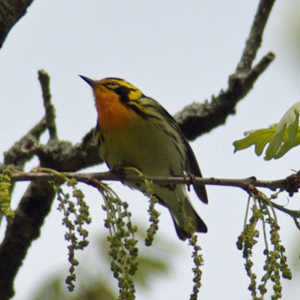 Although many migrate southward in the fall, some of both sexes spend the winter in eastern Iowa caves and mines, hibernating either singly or in small clusters. They often locate near the little brown myotis, big brown bat and eastern pipistrelle. To maintain Northern Myotis populations in Iowa, there must be preservation of both summer and winter habitats. This species requires forest and forest-edge sites in summer, including roost trees, and caves and mines throughout the year.